Why does the client need the additional capacity provided by the credit line? Are their any signals that point towards current and future intent of this customer? How will the client repay the loan? What are the primary sources? What are the back up sources? How easy are they to collect and liquidate? More importantly what incentives do they provide for the customer to settle his or her obligations amicably and willingly? If this loans gets into a workout or adjustment situation, how likely are we get to paid? What can we do to improve those odds? How do we interpret the results of our analysis. Do the financials support the assertions we have made above? It’s all about the applicant’s intent – to pay back the loan. If the person who walks in the door with a loan application doesn’t plan to pay you back, your sophisticated analysis is not going to work and the money is not coming back. How can you judge intent? Difficult question! Integrity helps, commitment helps, track record helps, collateral helps. These are very powerful indicators that can allow a loan officer to assess if there are enough incentives for the business and it owners to make the lender-borrower relationship work. To a large extent these four indicators are closely linked and feed off each other, we will come back to them again in the course. Risks come in different shape and form and buyers of risks have different risk profiles. In order to benefit from dealing in a “risk” market, it is important for a buyer to understand the many dimensions of a certain type of risk as well as his own risk profile before agreeing to take on the risk. Credit also comes in different grades. Lenders use a grading or scoring system to grade credit (ideally automatically or through a process) and then fine tune and tweak that grading based on individual assessment. The credit grading and scoring system may have many moving parts that will change over time. The evaluation, classification and selection of a certain risk from a basket or pool of risks, is called underwriting. When a loan officer at a commercial bank, agrees to lend money to one customer from a pool of applicants, he effectively underwrites the loan. Similarly when Investment Banks offer to raise capital from public markets for their clients, they underwrite the public offering. Within an insurance setting an underwriter evaluates, classifies and selects risks that his company is willing to take. Although application and terminology may differ across industries the basic principles and objectives are the same. It is part art, part science, part instinct and part process. You must remember that there is a subjective as well as an objective side to a credit decision and the right balance needs to be maintained between the two. From a customer’s perspective, underwriting plays an important role on how a product is priced or offered. 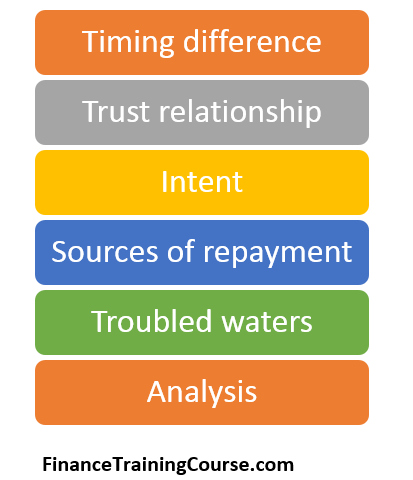 A loan officer’s assessment of financial prospects of a firm will determine if a credit line is extended and the interest rate charged on the line. Similarly an investment bank may decline to represent a client if required benchmarks for profitability, sustainability, viability and value are not met. Even if benchmarks are met, pricing for the offering would be dependent on the attractiveness of the issue. Finally in an insurance context, it is important that all insured pay a premium proportional to the risk they want their insurer to bear. In all of the above three cases, pricing is a function of te original classification. In a lending environment, pricing and structuring go together. The answer to the six questions we have asked at the beginning of this lesson determine the shape and form of the term sheet offered to a client. Classifications biggest contribution lies with the final decision making. Even if a risk is classified and priced appropriately, the buyer of risk may decide to not take it on. Subjective factors, such as an organization’s culture, its competitive positioning (conservative, competitive, aggressive) and its strategic objectives exert considerable influence on the final decision taken. Each loan, each IPO prospect and each insurance policy is different from others and it may or may not fit the profile of the customer a loan officer, an investment banker or an insurance underwriter is willing to accept. A bank geared and focused towards middle market and SME risk has the expertise, the infrastructure and most importantly the risk appetite to deal with middle market risk. What would be acceptable to this bank may be unacceptable to a bank focused on high end triple A rated relationships. Conversely the same bank focused on middle market customers may decline triple A rated credit because it may not be a good fit for its portfolio.